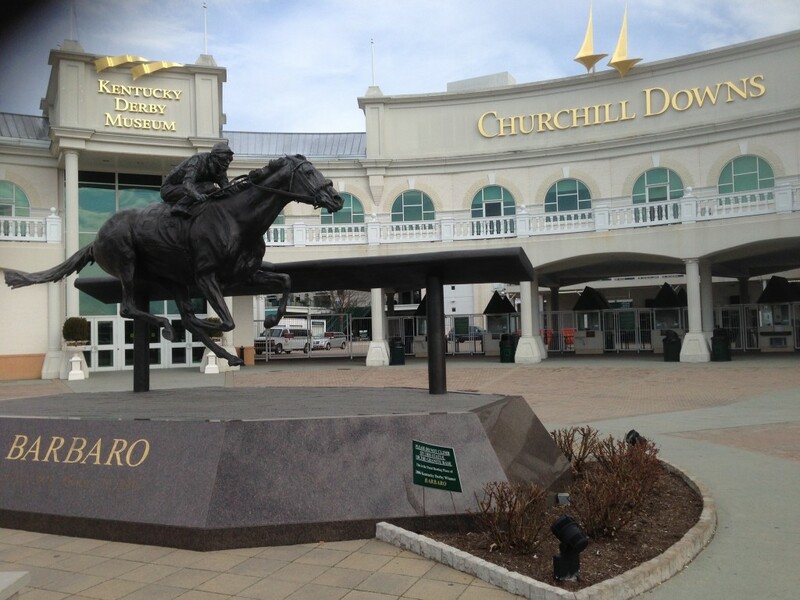 Are you looking for a great last minute family getaway for the holidays or New Years? Maybe you want to wait for the airfare prices to dip and take a trip in January. 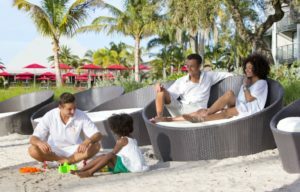 If you do decide to head down to Florida for the holidays or add on a few days when visiting family, Club Med Sandpiper Bay is a extremely fun and relaxing all-inclusive family getaway. For the holiday season, they have special holiday programing including a Snowman on Sand Contest, holiday themed parades and shows, meet-and-greets and gifts for Santa, elegant holiday dinners and festive cocktail parties. This is on top of their already comprehensive schedule of programs and activities for both adults and kids. 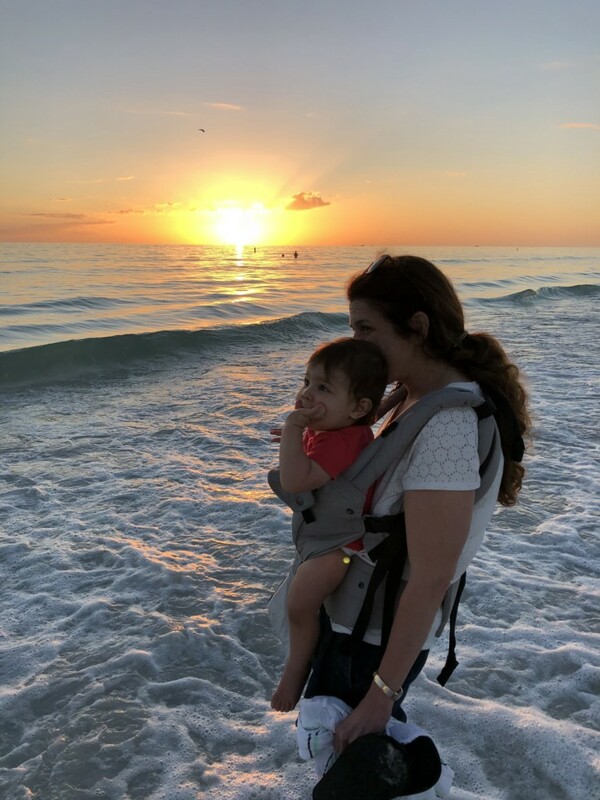 We decided to add on a few extra days when visiting the grandparents nearby in Boynton Beach a few months ago and drove just an hour to Club Med Sandpiper Bay in Port St. Lucie, Florida. Did you know there was a Club Med so close in the U.S? The last time I was at a Club Med I was single and in Turks and Caicos. Having the ability to still enjoy the French influence with the amazing culinary options, extensive activities, relaxing spa, and above all, the award winning baby and kids clubs made for an exceptional getaway. My daughter has never been in daycare, so I didn’t know how it would be dropping her off at the Baby Club, but once there, she had a great time with the other children. The GOs were terrific. They took her to lunch, put her down for a nap, went for a ride around the resort in their buggy and then in the pool to go swimming. This was in addition to the open play they had for the various age groups. They have baby and kids clubs for children up to age 17. The international buffets were terrific. 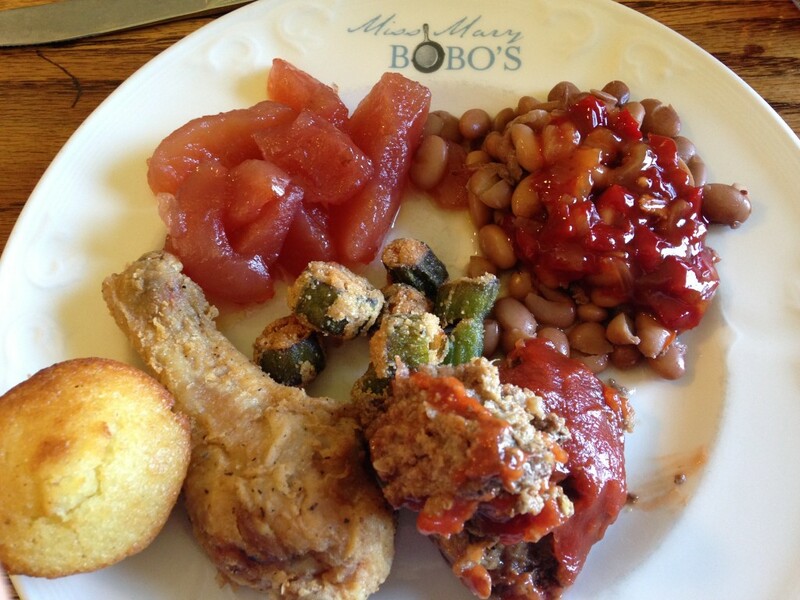 Each breakfast, lunch and dinner had a different theme each day. And of course their traditional chocolate bread was included! 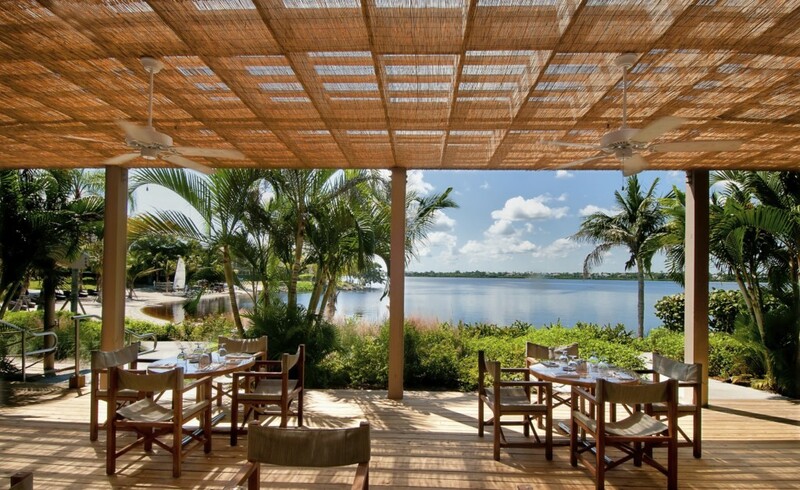 There is also an option to enjoy a sit down restaurant, also included in the cost of the resort. They offer babysitting, for a small charge, to watch the little ones at night if you’d like to make it a quiet and romantic night. The buffet seating is extremely family friendly with lots of kids all around, plenty of high chairs and a selection of food for all ages. They also have a baby bar with soft foods and milk, a bottle warming station and other staples for your baby. Club Med Sandpiper Bay makes traveling with your little ones very simple. They will provide you with a pack n play, diaper station in your room, a baby bathtub, and a stroller so you don’t have to worry about bringing any of that with you on your trip. We all know how much we already have to pack, so the fact they make it carefree also helps with making the trip as stress free as possible. I hope we can make Club Med Sandpiper Bay a family tradition. 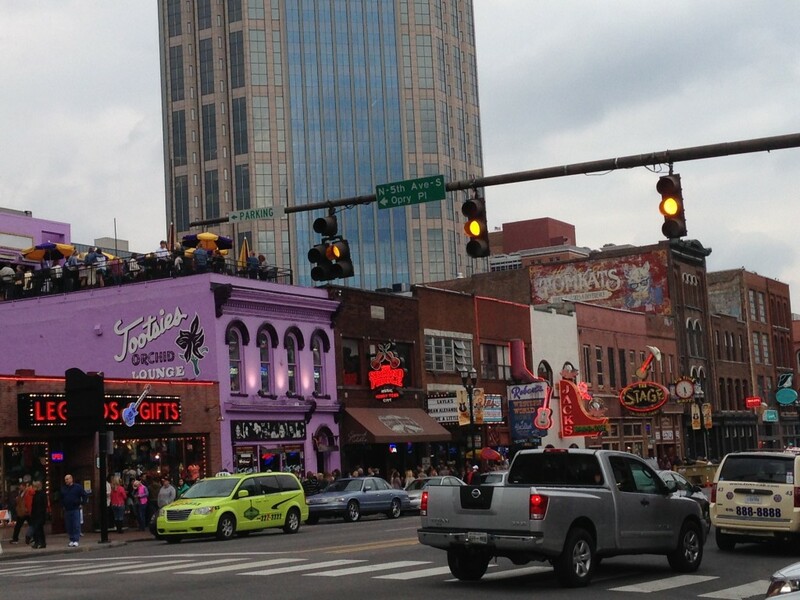 Maybe I’ll pull in the rest of the family too because it really is perfect for family getaways and reunions! Next Post: Liberty Science Center, Jersey City – Fun for All Ages! According to a recent study from HomeAway, 93% of Millennials would skip out on brunch if it meant they could go on a trip with their friends. I personally love a good brunch, especially when the weather is nice and lends itself for dining outside. However, now that I have a 15 month old, brunches are not nearly as relaxing as they used to be and I have found myself thinking I’d much rather be on the go doing something fun like traveling than sitting at a table holding it in place so my daughter doesn’t kick it again and knock the water glass into the waitress. So how many brunches would it take to save for a weekend away? HomeAway did the math to find out just how many orders of avocado toast and mimosas you’d have to skip for a weekend away in some of the country’s top destinations. Some destinations like the Poconos would require as little as two skipped brunches for a 2-night stay in a HomeAway vacation rental home. You can find the brunch index here. We decided to do just that and get out of the city for a last minute July 4th holiday. Normally I avoid traveling during the holiday times because everything, including accommodations, are at their peak prices. 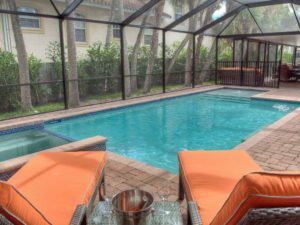 However, when I hopped on HomeAway.com, I was able to find a great place to stay for a very reasonable price. 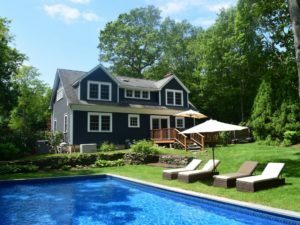 HomeAway, a site for renting beach houses, cabins, condos and more, offers vacation rentals in some of the hottest destinations for summer getaways, and because you’re renting an entire home, you will end up paying a lot less than if staying at a hotel and paying for more than one room. 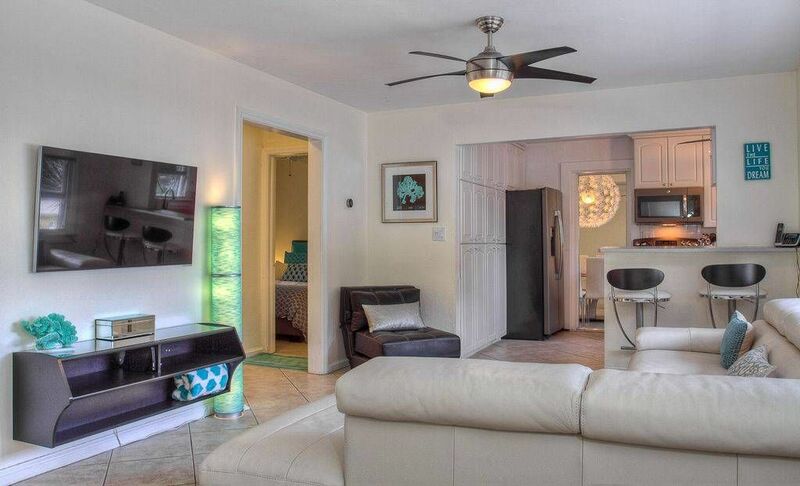 Bonuses include kitchens, laundry and sometimes a pool on property. I find it perfect for family travel. You can find some great getaways here. Since beginning this article, I had a conference in Philadelphia and my family was joining me. By the time I decided to go to the conference, hotel prices in the area were well over $300 a night. I found a great two bedroom apartment a few blocks from the conference in historical Old City for just over $100 a night. 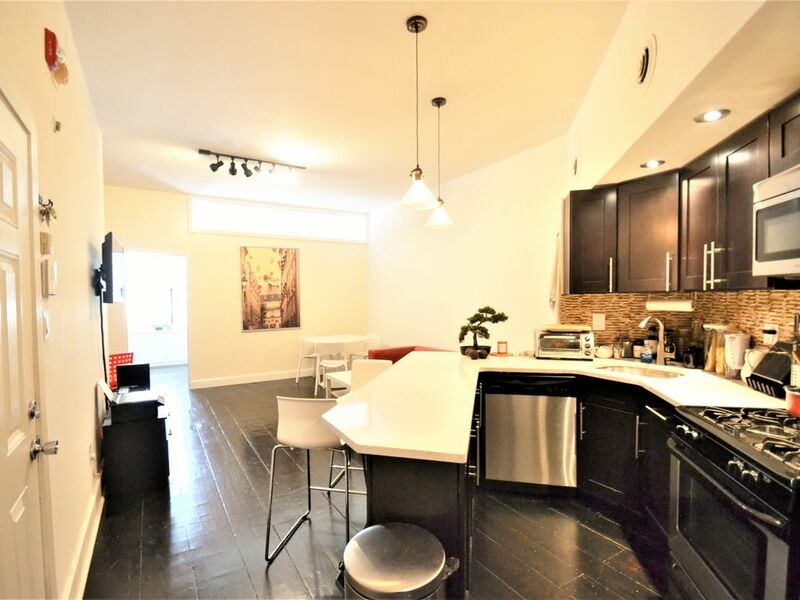 With the 1000 square foot apartment came a kitchen, laundry and free parking in the area, which is basically unheard of in Philly! The apartment is newly renovated and spacious, and the owner, Avi Lasri, was great at corresponding and answering questions. My daughter had a great time in this apartment because she was able to walk from one end to the other without any safety issues. It was furnished nicely and minimally, so we we didn’t have to worry about hiding anything or guarding anything from her. It is on the second floor of a walk up but we had no trouble. We just left our stroller in the car so we didn’t have to carry it up and down since we have the UppaBaby Vista which is awesome for traveling and storing things underneath, but can be tough to carry up the stairs if you are by yourself with your baby. His property is # 1349867 on HomeAway.com. 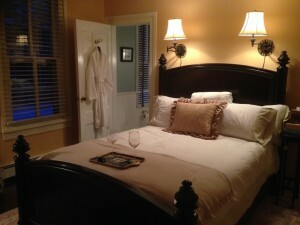 We stayed in beautiful Newport, Rhode Island for three nights. 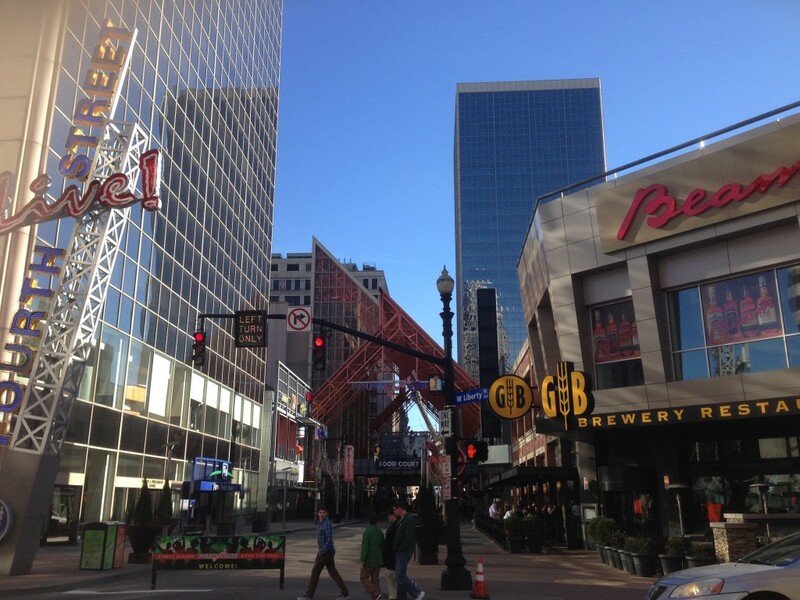 The downtown area has some great shops and restaurants. The Cliff Walk is a gorgeous 3.5 mile walk overlooking the water and runs adjacent to the mansions. It does have some steps and in parts a lot of rocks, so if you’re traveling with little ones, you’ll want to skip the stroller and use a carrier. With the seafood being so fresh, we had some terrific meals. For lunch one day, we went to the Grace Vanderbilt Hotel. The Colonial House existed on the 41 Mary Street Plot as far back as 1720. 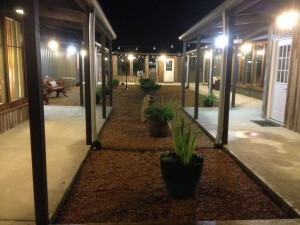 A luxury boutique hotel, it is kid and pet friendly. The Grace Hotel brand also has locations in other northeast coastal towns of the US, the Greek Islands, northwest Argentina, and in the exclusive Barrio residential and commercial district of Panama City. 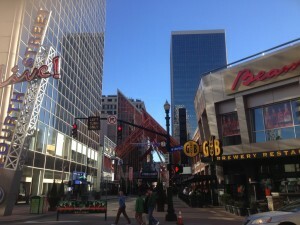 The restaurant, Vanderbilt Grill, is a great spot to have lunch or dinner. If the weather is nice, meals are served in their peaceful garden area and if it’s not ideal weather, their inside space still feels as though you are in a sunroom overlooking the garden. 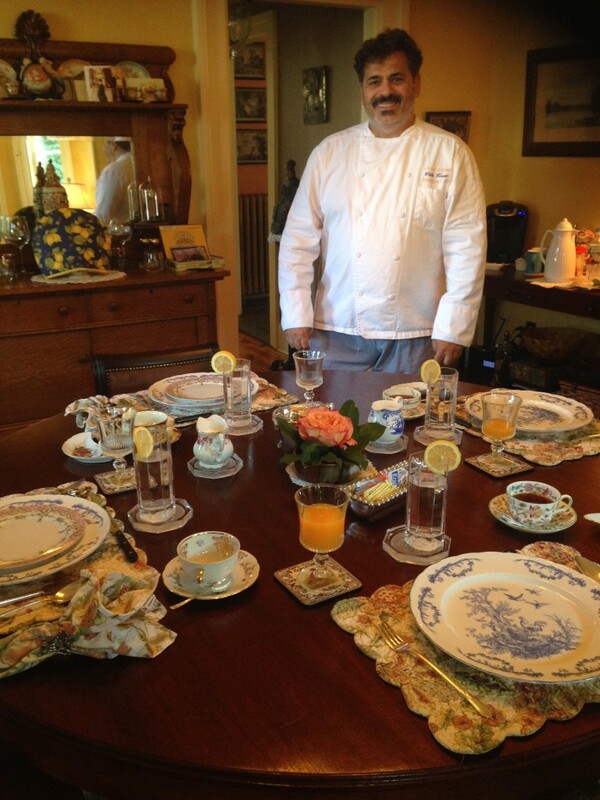 The executive chef, Anthony Theocaropolous, specializes in Mediterranean and Italian cuisine. 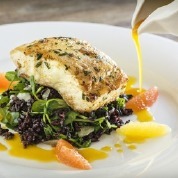 He incorporates locally sourced seafood into his classic and contemporary sea-to-table dishes. I had heard that he had won the award for the ‘Best Octopus in New York’ by Ask Men, so naturally I had to try it. It really did live up to its title. 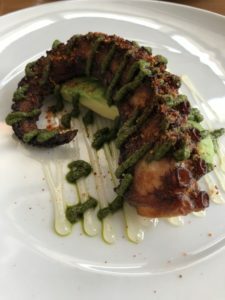 The octopus is braised in soy and marin with meyer lemon gel, smoked potatots, avocado, basil pesto and espelette. The combination of flavors in each bite was heavenly! 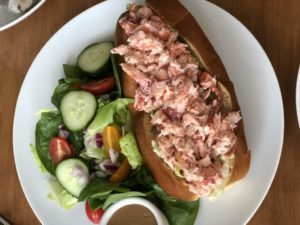 I also enjoyed his seafood salad and lobster roll (yes, my eyes were bigger than my stomach!) My 15 month old went to town on a plate of salmon, spinach and avocado. Newport is a great place to be on the water. We took a sail in the middle of the afternoon with Classic Cruises of Newport. Their boat was great – large enough to have plenty of space but small enough to make new friends while sailing. 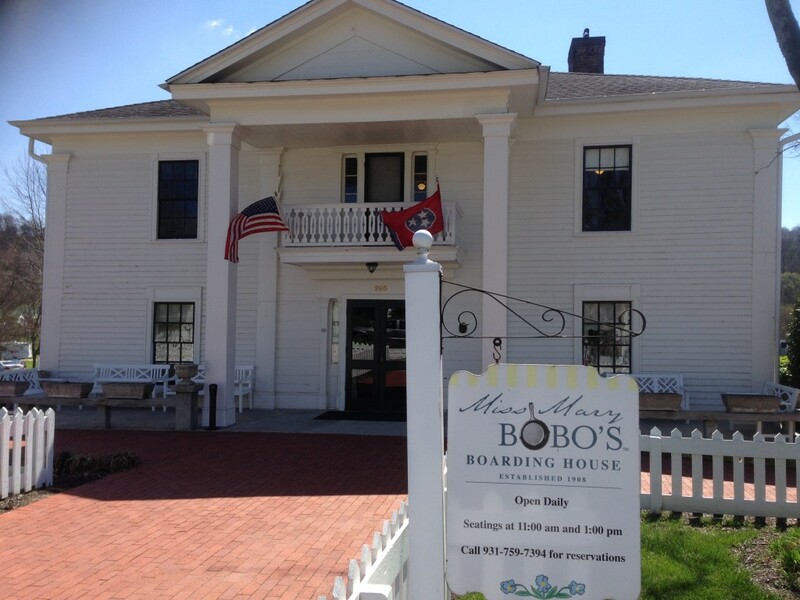 You’ll set sail on their 72 foot schooner. For their aftenoon sails, they provide complimentary water and iced tea and for their sunset sails, champagne. It was a very relaxing way to see Newport Harbor and Narragansett Bay while also learning about the area. 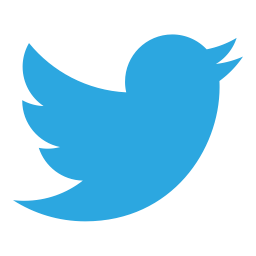 For more ideas and things to do, here is a great website that lists all of the activities going on this season. 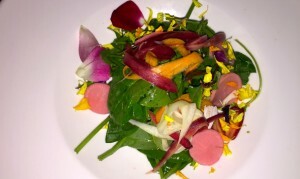 Now’s the time to enjoy all the beauty and great cusine of the New England coasline. 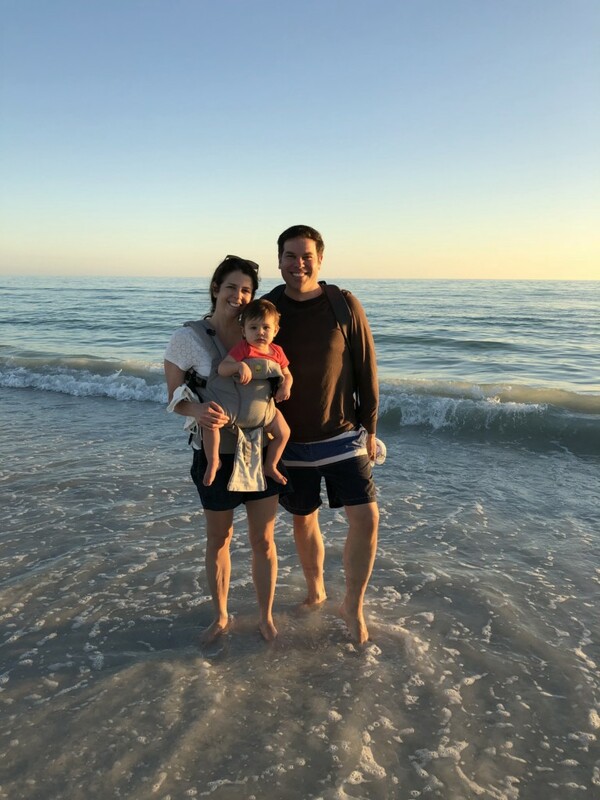 We decided to take a trip to Sarasota – only a two hour flight from New York and home to the beach ranked number one in the country – Siesta Key Beach. This was our first trip that was not to visit family with our baby. Because of that, we decided to stay at a vacation rental property so we could have a separate room for our baby to sleep and nap and we would have all of the comforts of home with a full kitchen and washer and dryer so we could prepare her and our meals easily. It also saved us money because we went grocery shopping instead of eating out all the time. 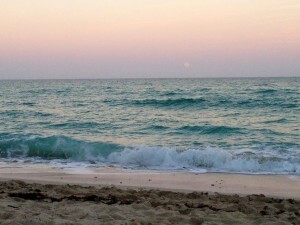 According to statistics from HomeAway, the beach is the number one destination for vacation home bookers, with Panama City topping the list of HomeAway’s hottest destinations based on overall demand, followed by Orange Beach and Gulf Shores, Alabama, Walton County, Florida, San Diego, Four Corners in the Disney area, and Hilton Head, South Carolina. Internationally, Paris is currently the number one destination for vacation home rentals followed by London, Rome, Puerto Penasco, Mexico and Florence. In addition to the bonus of having all of the amenities of a home while on vacation, for any group that would normally book more than one hotel room, you’ll save a lot of money. You’ll also get a ton more space. 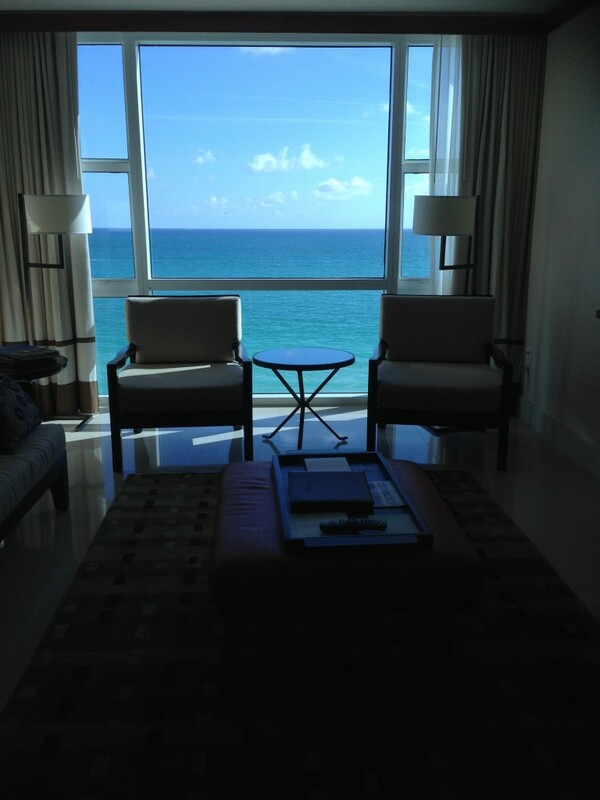 The average vacation rental home is 1850 sq ft. versus the average hotel room that is 325 sq. ft. It’s also easy to find a pet-friendly accommodation in most destinations. You’ll truly enjoy an authentic travel experience. Previous Post: Cape Cod with a Six Week Old! Next Post: Planning a Memorable 1st Birthday Party! Cape Cod with a Six Week Old! 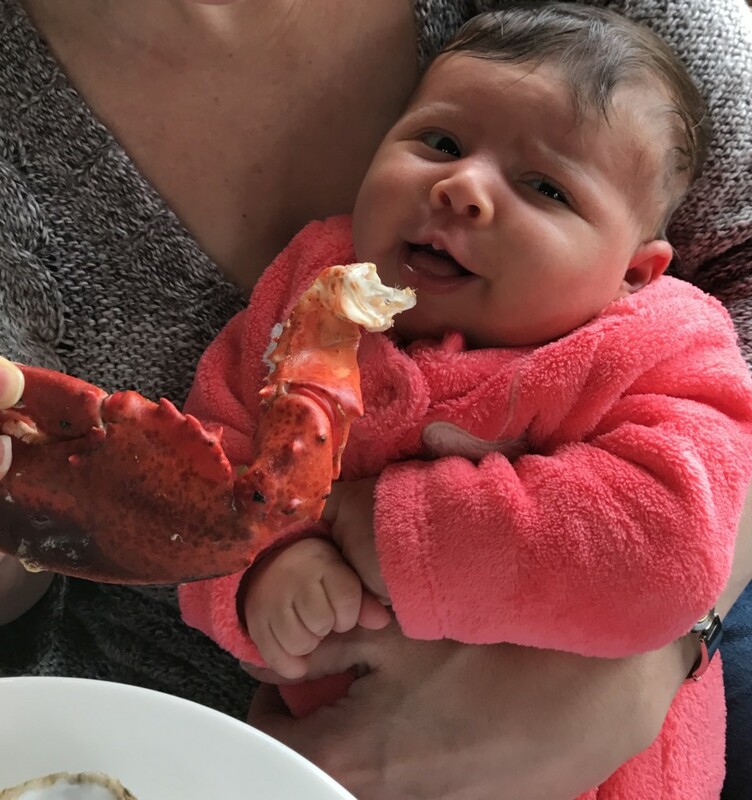 A close girlfriend was getting married in Harwich, MA on Cape Cod and when I realized my baby would be six weeks old at the time of the affair, I didn’t think it would be possible to go. My pediatrician was telling us not to take her to a hotel room which could be filled with germs or to a crowded wedding, and of course the thought of a five hour car ride was daunting. However, as it got closer and I had a better handle on what my baby was like at that stage, I felt adventurous and wanted to give it a shot. 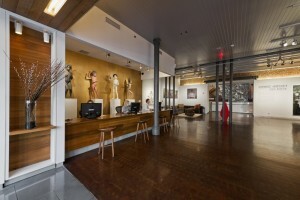 In addition, I found a great place to stay that made my decision that much easier. We drove a few hours from New York City and stopped halfway in Mystic, Connecticut, which was a great place for a break to eat. 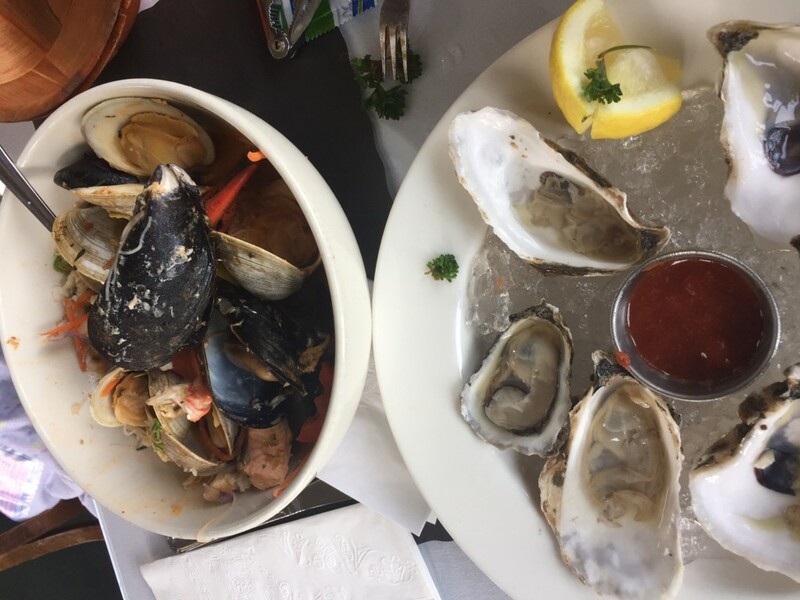 My husband tried the pizza from Mystic Pizza and I was ever so happy to have oysters from one of the many restaurants on the water, since I had to abstain for nine months. It’s a great area for walking and taking in the beautiful scenery. We then got back in the car and drove another couple of hours to Chatham and the Pleasant Bay Village. 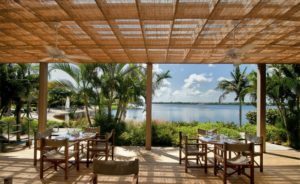 When I saw Pleasant Bay Village online, I knew it wasn’t a cookie cutter hotel and had rooms that were perfect for traveling with a family. 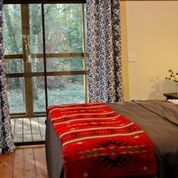 With accommodations to suit many needs, they offer efficiencies with a full kitchen, outdoor furniture, and a BBQ grill, as well as standard and deluxe rooms with two queen beds and a sitting area outside. All rooms are non-smoking and have air-conditioning, heat, high definition flat screen televisions, small refrigerators, irons, ironing boards, hair dryers, phones, private bathrooms and daily housekeeping. They are a green property and, utilizing a 22kW photovoltaic array to generate approximately 25% of their annual electricity and a solar thermal system to reduce consumption of natural gas. They also use non-toxic cleaners which I think is great if traveling with infants. So many times the hotel room can smell from the products used to clean them. They have been awarded the Green Leaders Gold Level Certification by TripAdvisor, Cape and Islands Green Verification and are recognized as an Energy Star partner. 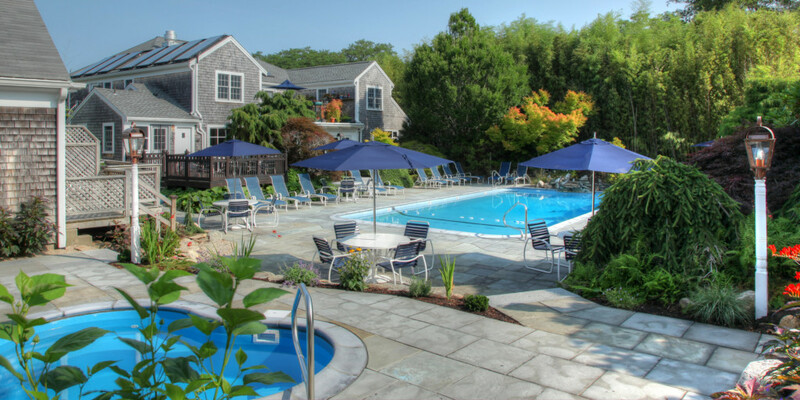 In addition to the meticulously clean and comfortable accommodations, Pleasant Bay Village also offers a heated outdoor pool near a beautiful waterfall, a hot tub surrounded by an Asian inspired rock garden and Japanese maples. A zen garden sits close to the waterfall and a Japanese Koi pond and makes for a great spot to relax and meditate. They serve a gourmet breakfast in their lobby which is furnished with 18th century antiques and lunch is served poolside in July and August. 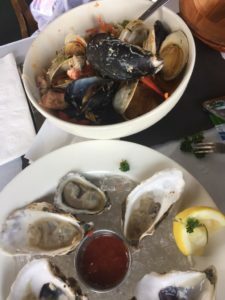 Just five minutes from Chatham center, main street is a great spot to browse boutique shops and enjoy fresh seafood at restaurants such as the Impudent Oyster (and yes, I got amazing oysters here too!). 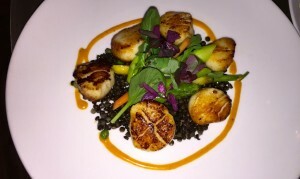 Be sure to make a reservation for dinner, as it does fill up quickly. We went for a late lunch around 2:30 which was perfect for our first meal out with the baby! It’s a quieter time than their busy lunch and dinner hours. 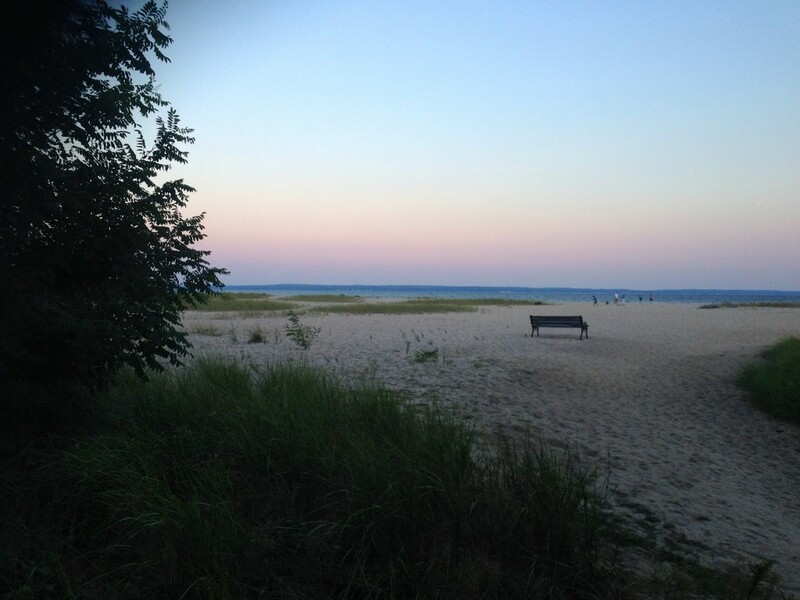 Beautiful beaches are also nearby and great for catching the sunset. All in all, I would recommend Cape Cod as a trip for those at any age! If you find the right accommodations to make your visit an easy one, you can make it a great family vacation – even if my daughter did cry and had to be taken out during lunch! Previous Post: The Courtyard Marriott Montvale – My Most Memorable Hotel Visit Ever! 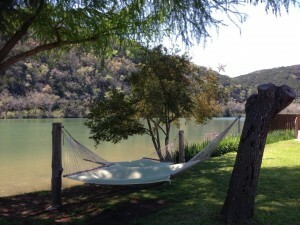 Next Post: HomeAway – Ideal for Family Travel! 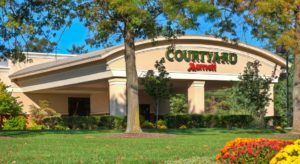 The Courtyard Marriott Montvale – My Most Memorable Hotel Visit Ever! Living in New York City, one doesn’t often think about traveling right over the George Washington Bridge to stay at a hotel in Bergen County, New Jersey. However, the situation was different during Nor’easter 2017. I was due to give birth two days prior at the University of Hackensack Medical Center, Pascack Valley in Westwood, NJ and we decided to stay for two night in New Jersey just in case I went into labor and the it was too dangerous to drive from the city. I am so glad we found the Courtyard Marriott Montvale. 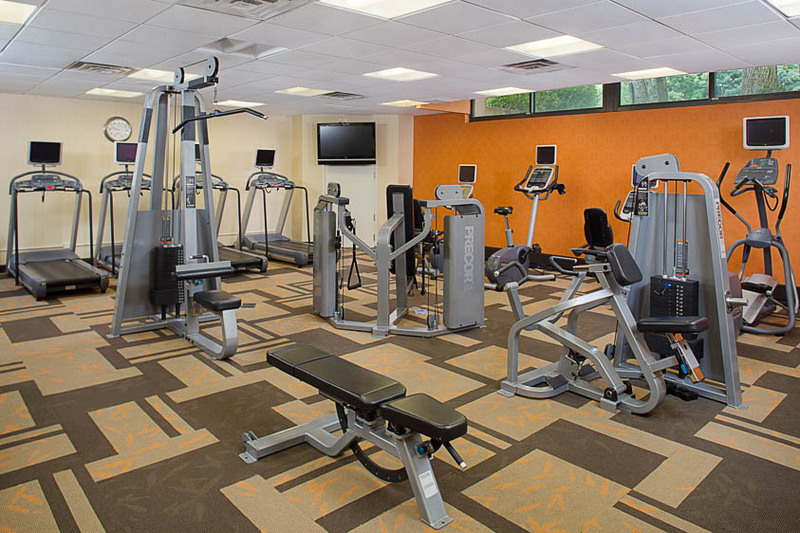 A quick 35 minutes from the Upper West Side, it is just 15 minutes from the hospital. 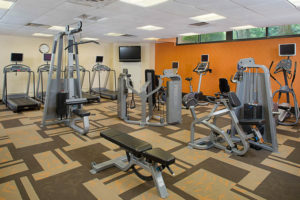 For days when the weather is nicer, it is also centrally located to Harriman State Park, the Garden State Plaza Mall, the Meadowlands Complex, West Point and Woodbury Commons. For those looking for a true getaway, there are a some great golf courses and spas in the area as well. The sheek hotel is very comfortable with 184 modern deluxe guest rooms, fitness center, an outdoor pool, billiard room, and spacious meeting space for businesses. Six luxury suites offer a whirlpool bath, wet bar, microwave and separate bedroom. 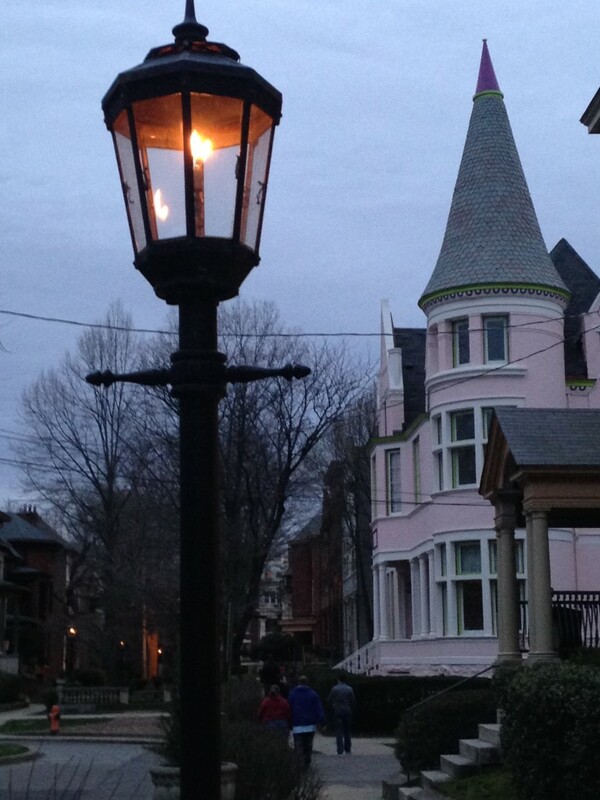 There is the lively Fire and Oak restaurant next door which is open late for food and drinks. They also have a beautiful banquet space for special occasions. 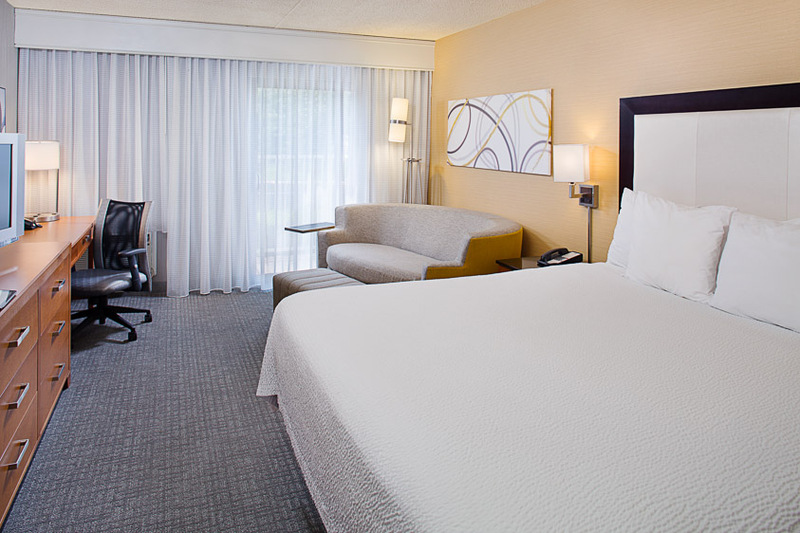 For your next staycation or affordable hotel close to both New York City and New Jersey attractions, click here for more information and to book your stay at the Courtyard Marriott Montvale! Update: This article was written before I labored in the hotel room for 10 hours! I woke up at 6am the day we were supposed to check out and started having intense contractions. My doula met me at the hotel and everything went smoothly! I was so thrilled the hotel staff was so nice and generous in asking if I needed anything and allowing us to stay until we left for the hospital at 4pm! I couldn’t have asked for a better laboring experience in a comfortable hotel with a nice bed, shower and wonderful staff! Next Post: Cape Cod with a Six Week Old! 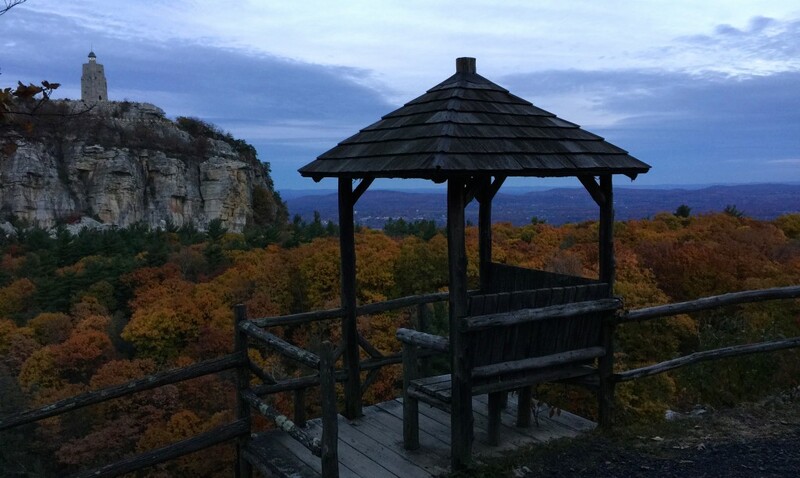 The Mohonk Mountain House, located in the Hudson Valley, just 90 miles from Manhattan, is an amazing place to call home for a few days. The resort is a member of the Historic Hotels of America. It was founded by Albert Smiley is 1869 and over 145 years later, the Victorian castle is still a site to see and experience. 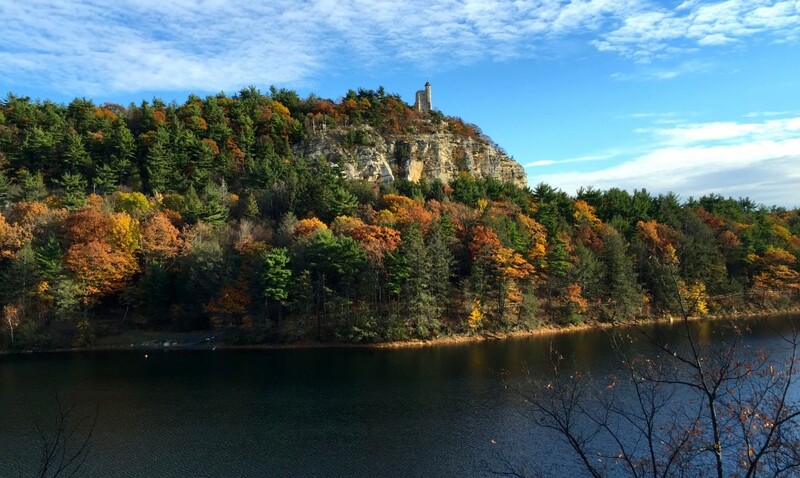 The magical Mohonk Mountain House offers unspoiled beautiful scenery, cuisine made using local ingredients, a serene spa and wonderful hospitality. Nestled among 85 miles of hiking trails of the Mohonk Preserve, its backyard is the spectacular Catskill Mountains. I had heard the property was something to see, but nothing prepared me for the thousands of acres of incredible fall foliage that was displayed in red, orange, yellow and green rows of trees With so many possible paths to explore, each turn offers an even more spectacular view than the last. 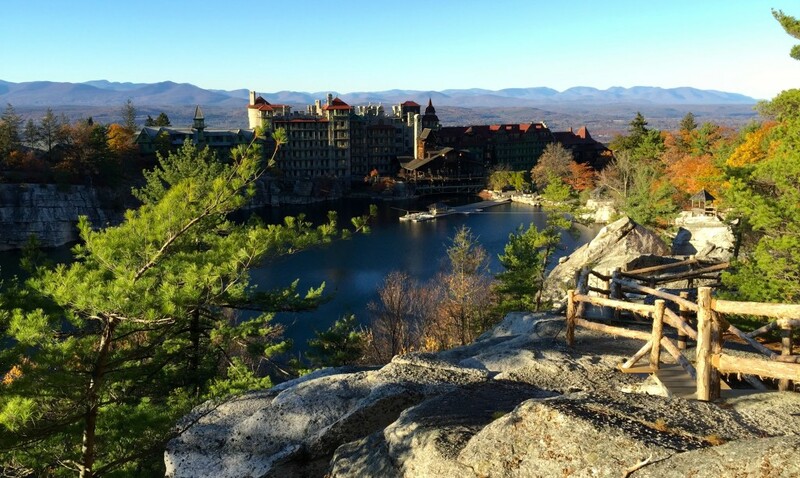 The Mohonk Mountain House has something for everyone. It’s an incredibly romantic resort, as you can find so many secret nooks with benches within the hiking paths where you can sit and take in the views. The rooms are spacious with their own private fireplaces. 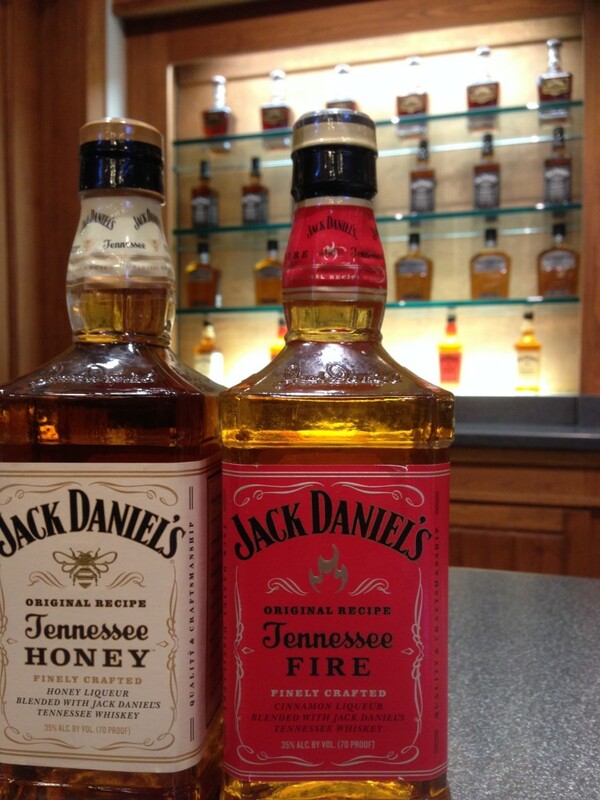 There’s nothing like cuddling up with your loved one by the fire with a good glass of wine. The spa offers an array of massages, facial and body treatments for individuals and couples. Each locker room also has a sauna and steam room and there is a co-ed heated mineral pool outside. A solarium also offers a peaceful space with lounge chairs in which the two of you can just relax and stare at the gorgeous outdoors. Looking to unwind even more? 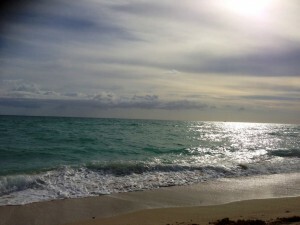 They offer an array of meditation classes and private meditation instruction. 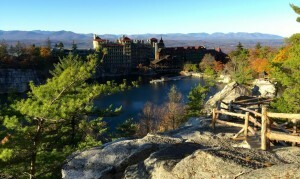 Mohonk is also great for families. There were many children enjoying the fun Halloween theme, haunted house and Halloween Ball. 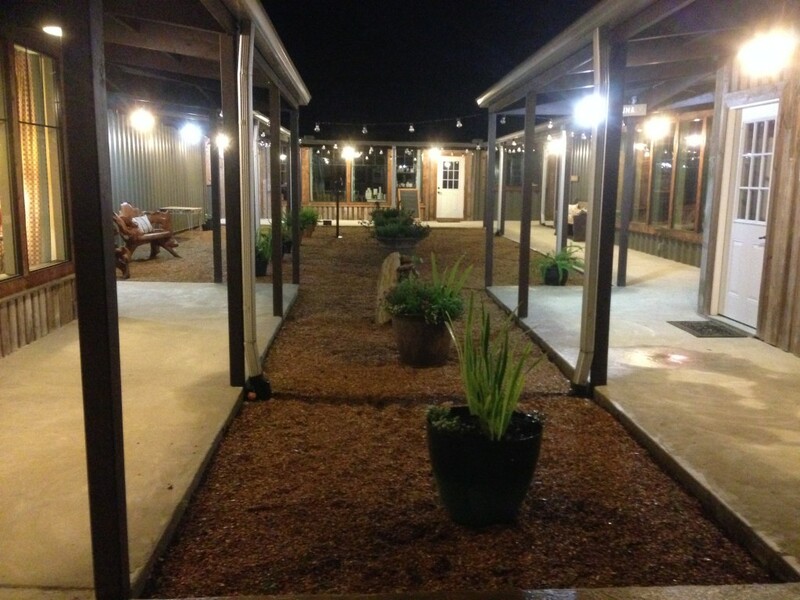 However, with the property and dining areas being so spacious, it did not affect the quaint romantic vibe. There is a ton of activities no matter the season. 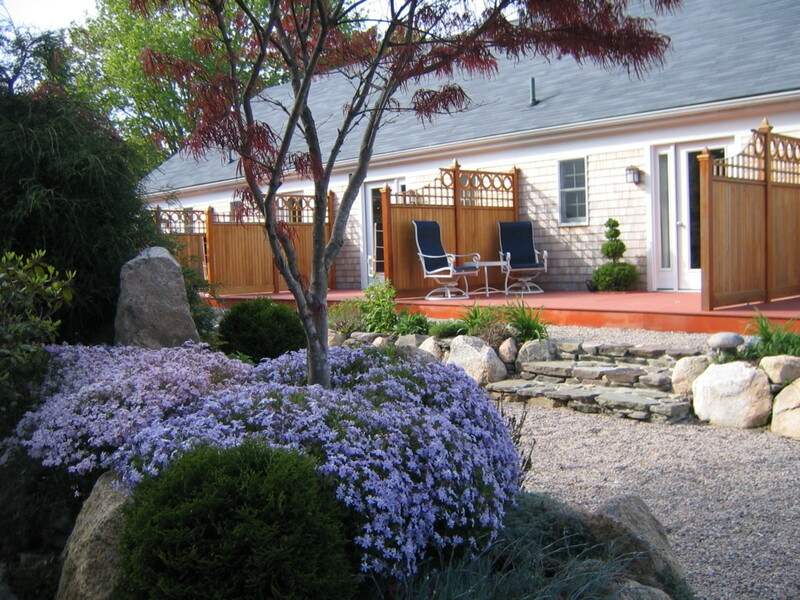 The property transforms with the season. While it will be tough to choose what to do in a day with so many options, one thing you’ll be doing a lot of is eating! For breakfast, you’ll enjoy a large breakfast buffet with an omelet and waffle station. If you’re there on a Sunday, you’ll have the breakfast buffet and also a huge brunch buffet which includes a cheese spread, lox, shrimp cocktail, an array of hot and cold dishes, salads and omelet and carving stations. Lunch is also a buffet consisting of salads international hot and cold dishes and carving stations along with an extensive dessert spread. For dinner, you can choose the casual buffet option or dress to impress for a formal sit-down dinner with a quality three-course meal with an extensive wine list. 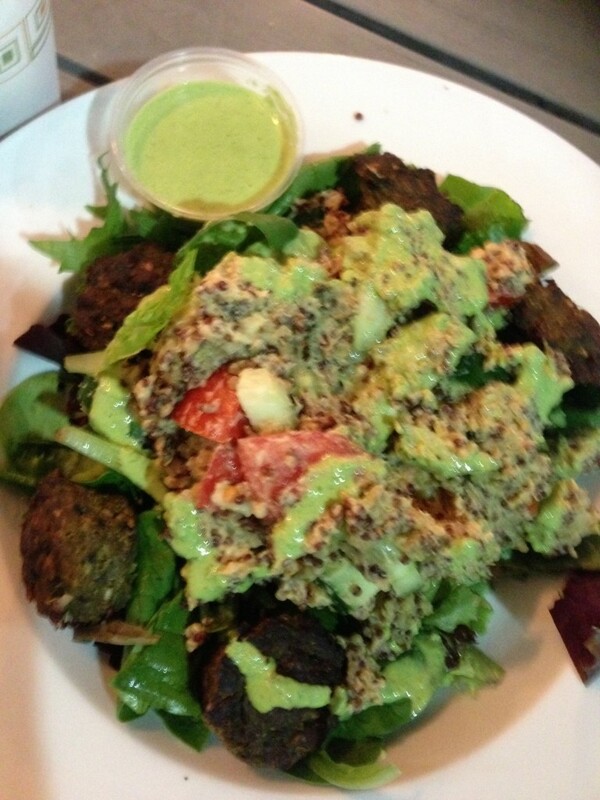 They also offer alternative vegetarian, vegan and gluten free options. 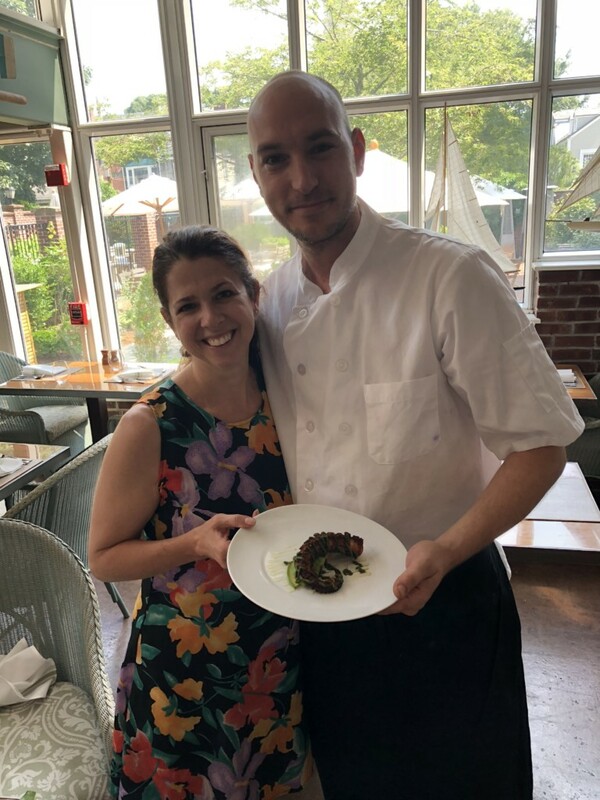 The award-winning chefs definitely go out of their way to make sure your dinner is prepared with your specific dietary needs and requests in mind. I grew up on Long Island. Yet, surprisingly enough, I had never been out east to the North Fork, known most predominately for its numerous vineyards, large and small. Upon arrival, I couldn’t believe I had never seen this part of the island sooner! It is the perfect place to celebrate a bachelor or bachelorette party, have a wedding, or a romantic weekend getaway with your significant other. There are many options for exploring, including hiring a car service, driving yourself (which I wouldn’t recommend) or biking to the vineyards, since they are so close to one another. However, I wanted something romantic, yet also fun and unique. For the romantic part, I stayed at the beautiful Wells House Bed and Breakfast, and for fun, we hired Michael Roche and his Wine Wagon. 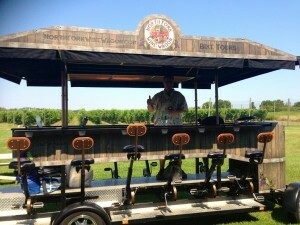 With room for 15, we all helped pedal our way to the vineyards while he steered, rocking out to our favorite tunes. He can hook up our own phone’s music or use his own and take requests! Since there were just two of us, we joined a larger group, which was a great way to make friends along the way! 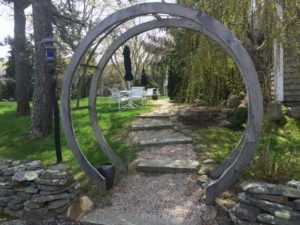 He will give you a central meeting point in Peconic and then take you to a few wineries and the Greenport Harbor Brewery Company. 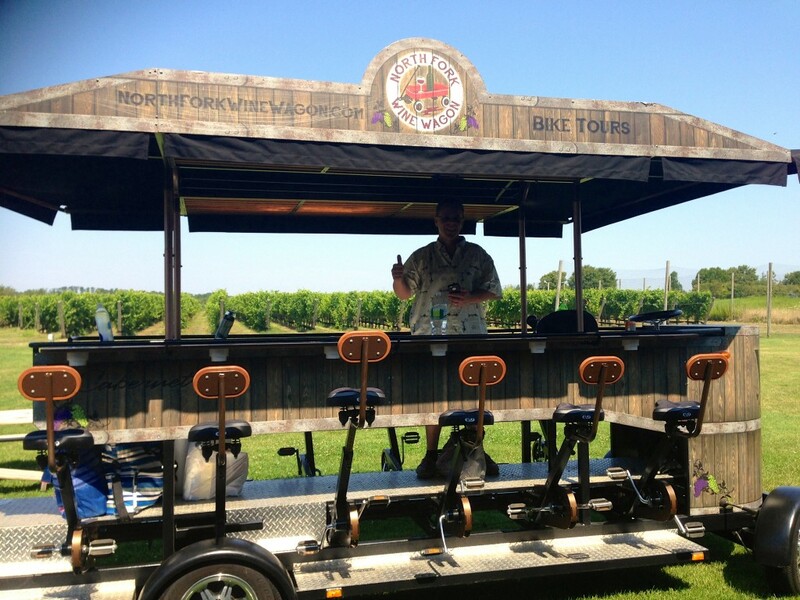 If you have certain wineries in mind, the tour can be customized to your preferences. He can be hired for either three or five hours. This is definitely an extremely fun and unique way to see some of the most beautiful wineries. 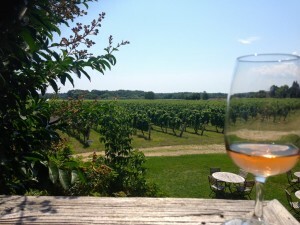 Most of the wineries are in Peconic. However, only a few minutes away is the lovely town of Greenport. Greenport has a quaint downtown area with great clothing and antique shops, the obligatory ice cream establishments, and some terrific restaurants. 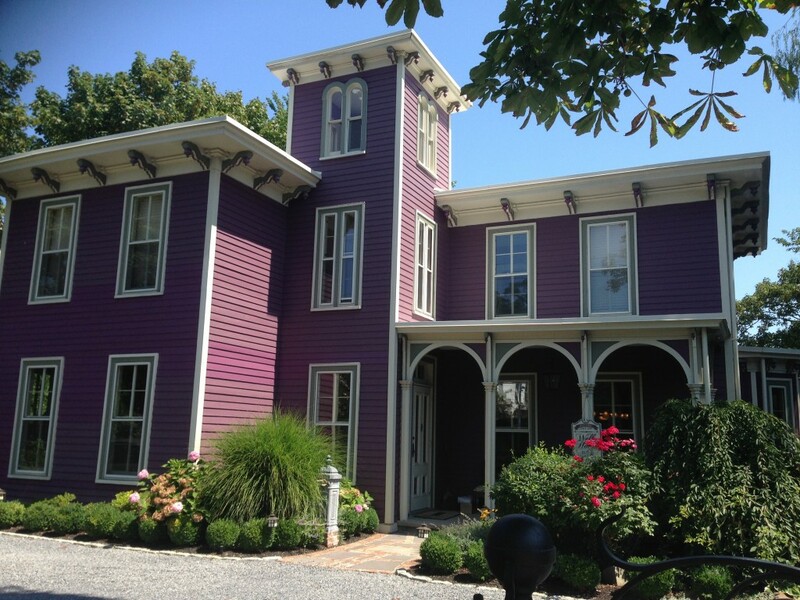 Within walking distance to all of this is the stunningly historic Wells House Bed and Breakfast. 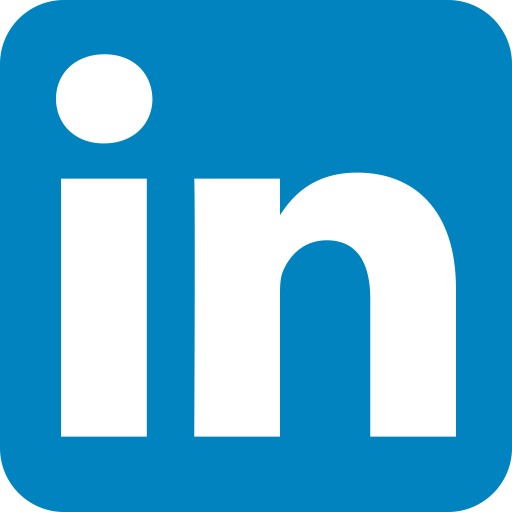 Vince Albert, a pioneer in the International Logistics and Sourcing industry for 30 years, is the owner, and will make you feel at home immediately! He is incredibly friendly, full of knowledge about the area and will recommend things to do and restaurants to check out during your visit. 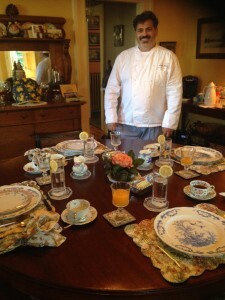 Did I mention he also makes an incredibly delicious breakfast? 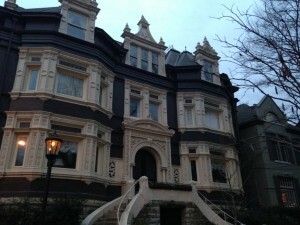 He will proudly show you around the beautifully restored European style home and unlock doors to historical treasures. The home was commissioned by Captain Wells, a married father of eight, and successful whaling captain before the Civil War. The following owner, David C. Petty, owned a popular bottling company whose bottles were handmade of blown-glass. 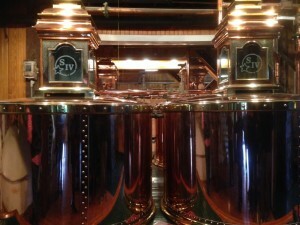 Two examples are on display at the bottling museum in the Midwest, and the other at the Wells House. This is just one of the many antiques collected over the past thirty years, with over 80% of them at least 100 years old. You can get lost in the stories that fill each room. 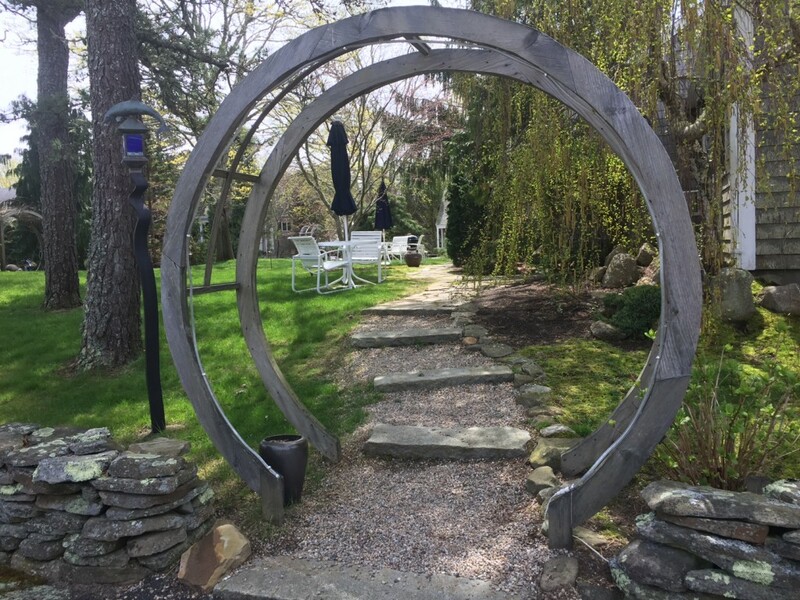 While there is plenty to do in addition to your vineyard tour, like stroll through Greenport, along the beach, or take ferry and bike ride to Shelter Island, make sure you leave enough time to enjoy the tranquility of the Wells House. So whether it’s your first time to the North Fork or you’ve been before, there is always a new winery to explore, beach to uncover, or romantic bed and breakfast to enjoy. 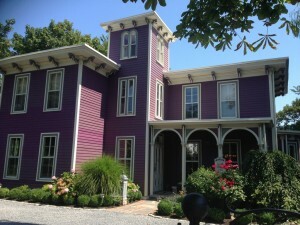 You can read more about the Wells House here: thewellshousebnb.com and Michael’s wine wagon here: northforkwinewagon.com. 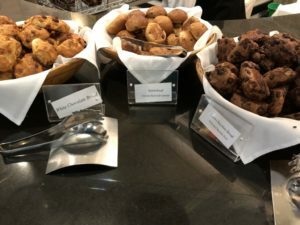 In Houston, the rodeo may have been in town, but after I landed at George Bush Intercontinental Airport, I was on my way to a lodge an hour outside of Houston to begin a very different roundup of health and wellness lodges and resorts for the week. First stop was the Deer Lake Lodge and Spa. The flight to Houston is not expensive on United Airlines, and the lodge offers a car service to pick you up at the airport. Brian from Creekside Limousine picked me up and gave me a great intro tutorial to the lodge on the way. I originally chose to come here after meeting them at an organic spa event in NYC last year. I have covered health and wellness facilities like Canyon Ranch (now known as Carillon Hotel and Spa) in Miami and Chiva Som in Thailand, but I’ve never done a true detox. 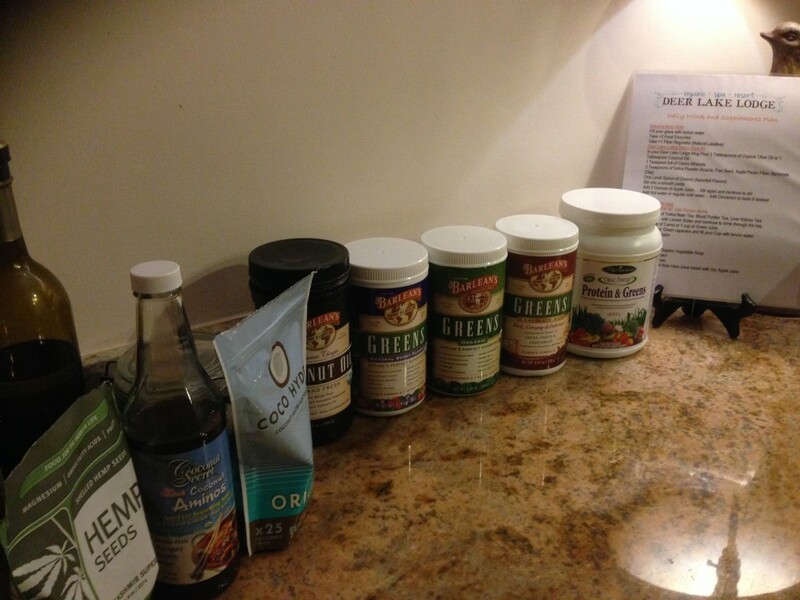 Based on what I knew about detoxing before arriving, I thought I was in for a few days of vegetable juices and wheatgrass shots throughout the day in combination with some light soups. When I first saw my program, the words shot out of my mouth, “Is this it for everyday?” Normally, I eat very healthy at home, so I didn’t think the whole program would be such a shock. However, it was a bit different than expected. Most of the time, I was very full, except for the second night after my soup dinner and yoga. Had I gone to sleep early, I probably wouldn’t have realized just how hungry I was! But other than that, you are drinking vegetable juice once a day and making a detox drink twice a day, which consists of a choice of green powders, a detox powder made up of apple pectin, flax seeds, acacia, and Benonyte Clay, a teaspoon of Clark’s minerals, and coconut oil. Mix that into a paste with some apple juice and add water. Very filling. Plus, in one of the food classes taught by the very informative and bubbly April Ree, you get to sample the amazing raw pudding she showed us how to make in the vitamix. She is chock full of fun simple recipes you can take home for you and your family. April, whose website is http://www.oceansofabundance.com, not only teaches some food classes, including the one about how to eat when coming off of a fast, but also will take you food shopping and show you aisle by aisle what you should be buying and items to avoid. Again, even as someone who knows quite a bit about healthy eating, I still learned a few new tidbits, which were helpful. It also reinforced some of what I may know, but don’t practice. The lodge offers a variety of packages from which to choose, but you can also purchase additional services, including a full array of traditional spa treatments, as well as colonics, which are administered by a certified hydrotherapist, Paula Hobbart. There are also lectures and sessions offered by a hypnotherapist, acupuncturist and iridologist, which I had not heard of before. It’s the reading of your eyes. While some alternative practices may seem “out there,” she said this is based on true science. Cheryl Lemoine Kainer took a picture of my eye and then told me a few things I should know about my body based on the different areas of my eye. The setting of Deer Lake Lodge and Spa is one of pure serenity. It really is in the middle of nowhere, so there is no temptation to leave and explore the area. In your down time, you can enjoy the infrared sauna, which has many benefits over a standard sauna, or just sit on your screen- enclosed porch and listen to the sounds of nature. As a girl who lives in NYC, with constant stimulation, it’s forced relaxation that is sometimes needed to truly unwind. It was really nice to alternate my day with classes and treatments and hours that were just mine with nothing I needed to do, but could spend writing or reading. 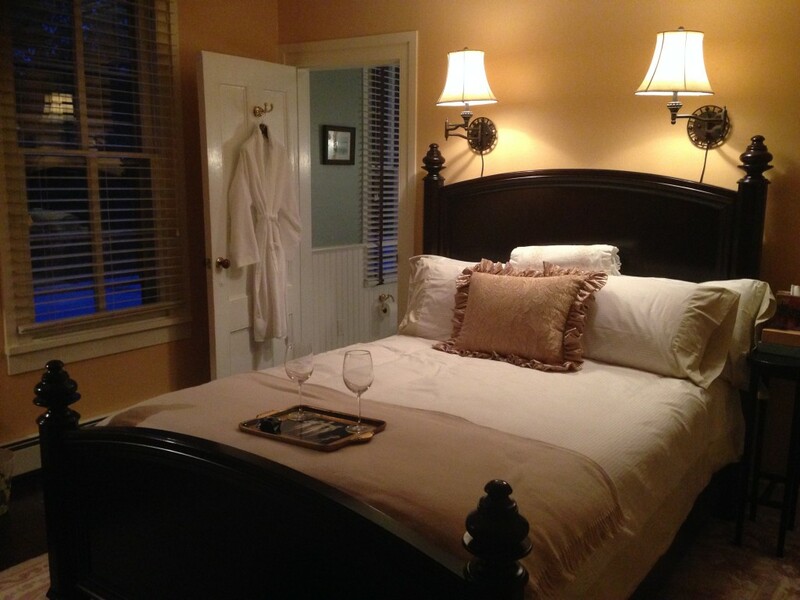 The rooms are very comfortable with organic linens and Jacuzzi tubs. It’s simply a great escape for a few days if you need a long serene weekend away or can incorporate it into another trip to the Houston area. Be prepared to slowly go back to your eating regime, as I did experience some stomach pain and adjustment time. You’ll also need to consult your doctor to get clearance for the colonics. 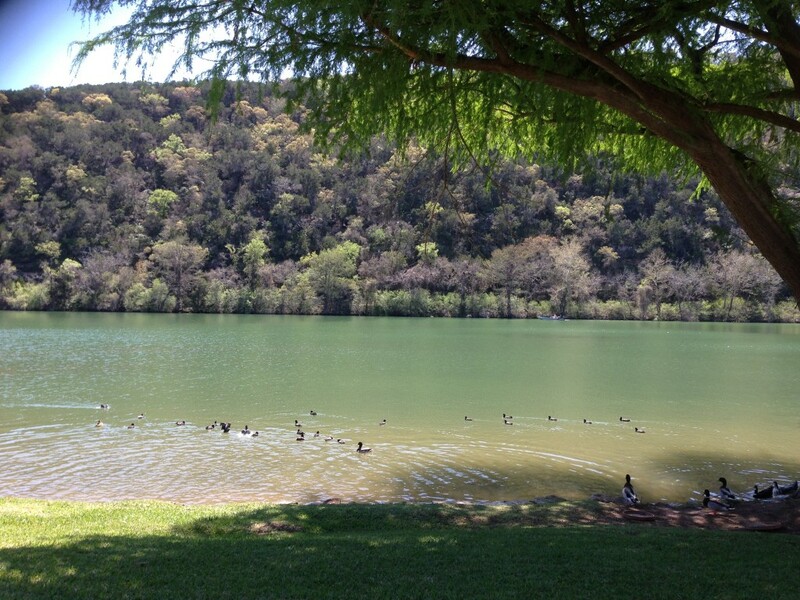 Next stop on the spa roundup was Lake Austin Spa Resort. A complete 180 from the Deer Lake Lodge and Spa, this resort is for those looking for a more active retreat with delicious healthy food and wine and beer selections. This gorgeous resort on the lake is great for girlfriend getaways, romantic retreats and just a relaxing getaway for one, which I thoroughly enjoyed. In beautiful Texas Hill Country, this resort includes all food, fitness classes and informative classes in your package price. 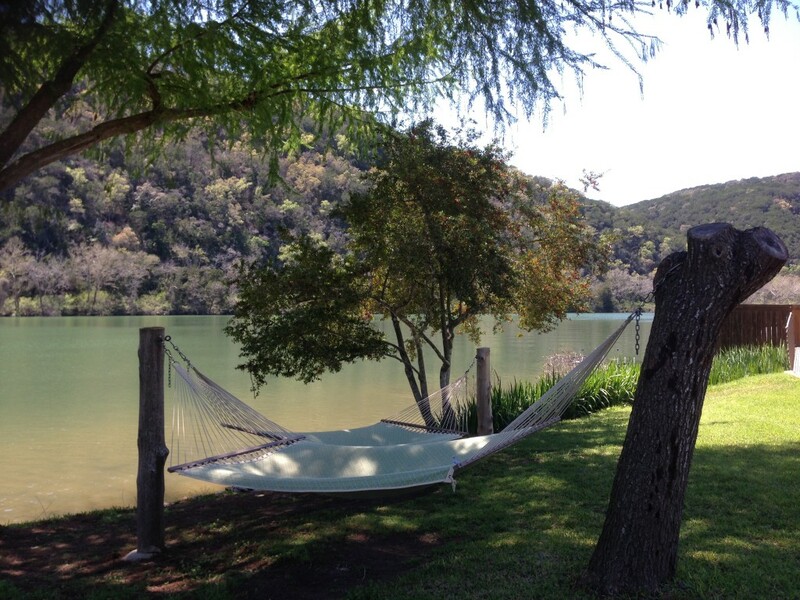 You can get whatever you’d like from the resort, from relaxing on a hammock by the lake listening to the ducks play, to working out and participating in the group hikes. My days consisted of taking out a kayak and paddling past blue herons, followed by a TRX class, a foam roller class, a NIA dance class, and a high intensity cardio and weight training class in the gym, and a relaxing swim in their pool barn. Enjoy the breakfast buffet, which includes fresh fruit and berries, yogurt, oatmeal and chia, flax and hemp seeds. There is also a menu of hot food from which you can order. Lunch was also a fresh buffet of vegetables picked from their organic garden. 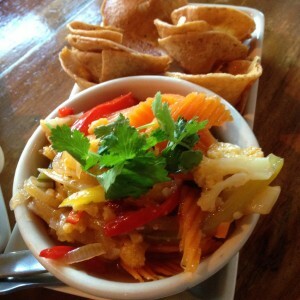 Dinner is a large selection of soups, salads, seafood and meat entrees, and vegetarian options. The spa also offers an alternative menu with healthy dishes such as their refreshing watermelon gazpacho soup and yellow fin tuna corn tortillas (I substituted bib lettuce for the tortillas) with vegan aioli sauce and avocado. After a day of fitness classes, treat your muscles to a massage molded to your personal needs. Glen was my therapist, and not only gave me the most amazing neuromuscular type of massage for my persistent rhomboid stiffness, but also showed me some stretches to help target the area. I opted to have my massage outside so I could listen to the relaxing sounds of the waterfall. 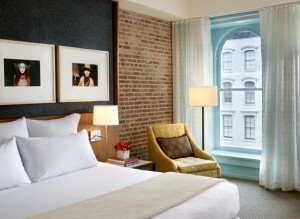 The very comfortable beds and pillows and the serene setting also made for some great sleeping. The stars and moon also shined bright at night. I highly recommend a visit to Lake Austin Spa Resort as a visit on its own or with a few nights to spend in Downtown Austin, as you won’t want to leave the property during your stay. After an hour and 45 minute drive, the next stops on my spa roundup were in San Antonio. 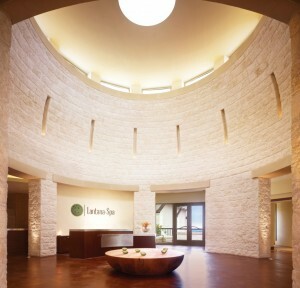 The Lantana Spa at the JW Marriott San Antonio Hill Country Resort and Spa and the Mokara Hotel and Spa in downtown San Antonio on the River Walk. The two properties are very different, with the huge JW Marriott situated on a PGA golf course with a huge six acre water park, pool, and kids club. The JW Marriott is one of three resorts in the US with two PGA golf courses. 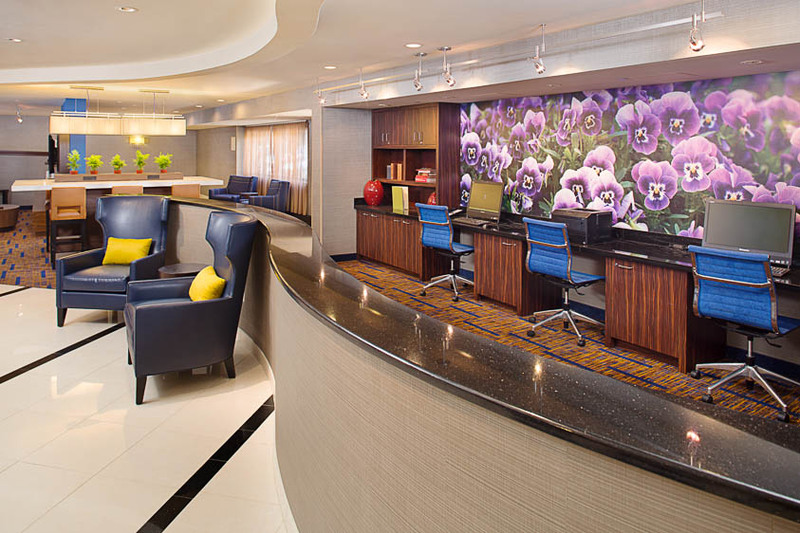 The hotel boasts 1002 rooms and 265,000 square feet of meeting space. The beauty of this property is that the whole family can visit if someone is there on business. Mom can enjoy the spa while taking advantage of the kids club, and because the property is so large, even though it can hold thousands of people, it never feels crowded. 18 Oaks, its fine dining steakhouse is a great spot for a romantic or business dinner. There are seven restaurants and bars on property. The Lantana Spa is a full service spa with a fitness center and exercise classes with a Jacuzzi, steam room, and private outdoor pool. My experience began with a unique seven knots ritual-tying a ribbon with seven knots completing a circle to release your stress and start anew. The 26,000 square foot spa is the largest in Texas. I was treated to their signature massage of the Curanderos. Compresses are filled with a blend of organic herbs that not only relaxes, but works on sore pressure points. It was a massage unlike any I’ve had before. The compresses worked deeper than a hot stone massage, since there is the ability to place it under a certain part of your body and apply pressure. 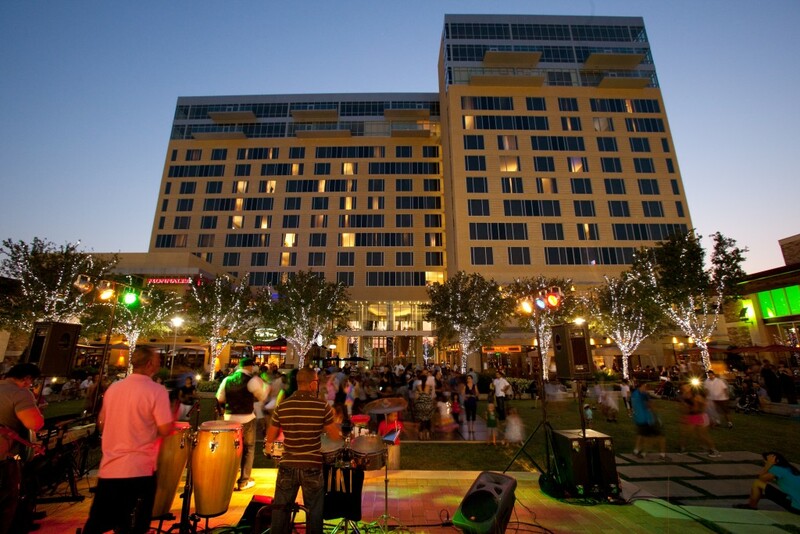 If you are staying in downtown San Antonio to be in close proximity to the River Walk, Alamo, and the Missions National Park, the Mokara Hotel and Spa is a beautiful property on the River Walk. When I was there, a wedding party from NYC was at the spa prepping for the big day. The high-end spa offers services for both men and women including everything from an express mani and pedi to hour or longer treatments. I opted for the alpha beta peel facial, which was an amazing in depth 80-minute treatment. It was a chemical facial treatment consisting of alpha and beta hydroxyl acids to minimize the appearance of surface lines, smooth out rough texture, aid in clearing acne and help fade hyperpigmentation. The esthetician was terrific, telling me along the way about all the SkinCeutical products she used throughout. In the women’s locker room was a Jacuzzi, steam room and sauna and relaxation lounge as well. 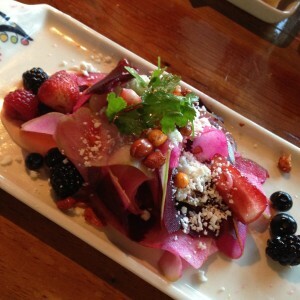 In keeping with the healthy trend, if you’re looking for a Mexican restaurant that utilizes fresh fruits and vegetables in all its dishes, check out Chef Johnny Hernandez’s The Fruteria, inspired by Mexico’s beautiful and colorful fruit stands. The name means, “green grocer” and the space is modeled after a Mexican Botanero for tapas and cocktails. During the day, the Fruteria serves smoothies made form fresh fruit along with tostados and tortas, and at night, the bartenders are mixing fresh fruit with regional tequilas. 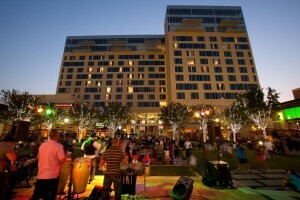 The restaurant is a short five minute drive from the River Walk and also has other locations throughout Texas. 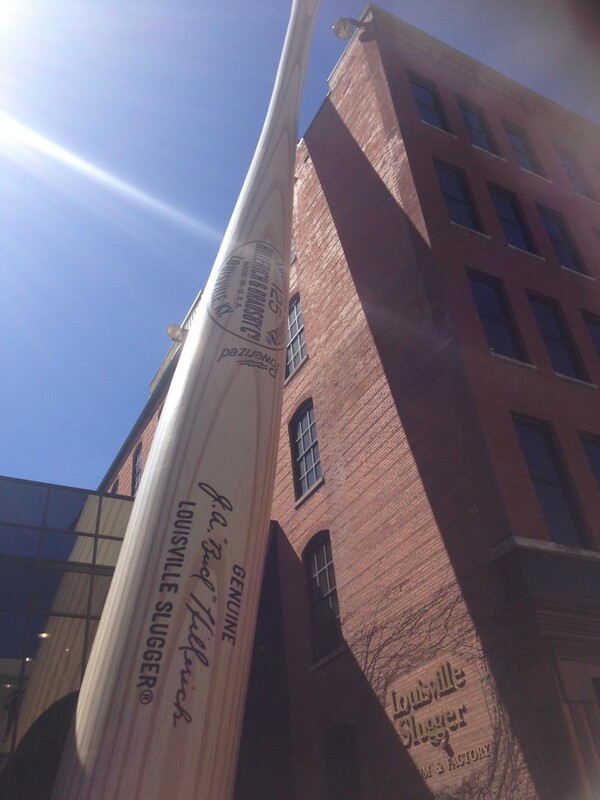 Even though I was on a spa tour, I always love incorporating other attractions into my travels if time allows. After I had finished my three and a half days at the Deer Lake Lodge and Spa, Brian took me back into Houston, where I did go to the final day of the Houston rodeo, a huge yearly event drawing hundreds of thousands of people. I stayed at Hotel Sorella CityCentre which was in a great new complex with shops and restaurants and a big green area with live music and a place for kids to play. It’s a great business hotel as well. 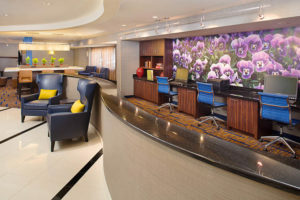 At the end of my spa tour, I stayed in the Galleria area at the Royal Sonnesta, which was also a great business hotel with a large lobby and bar. It’s an easy thirty minutes to the airport and also close to downtown Houston with plenty of shopping and restaurants in the area. 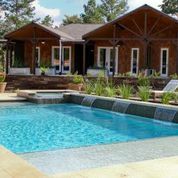 So the next time you’re looking to give your body a break from the everyday grind, learn a few new health trends, some wonderful spas and detox lodges are waiting for you not too far away in the Lone Star state! As they like to say, everything is bigger and better in Texas! 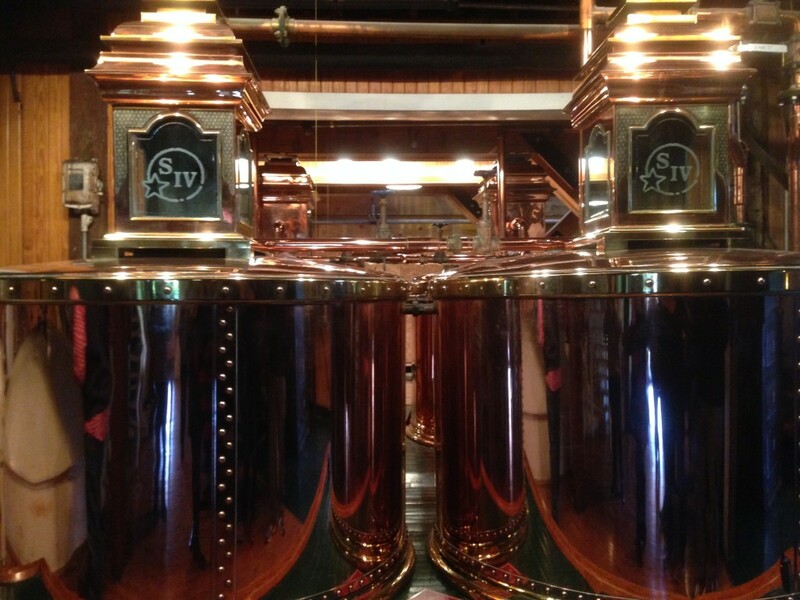 Next Post: History and Distillaries in Louisville and Lynchburg! 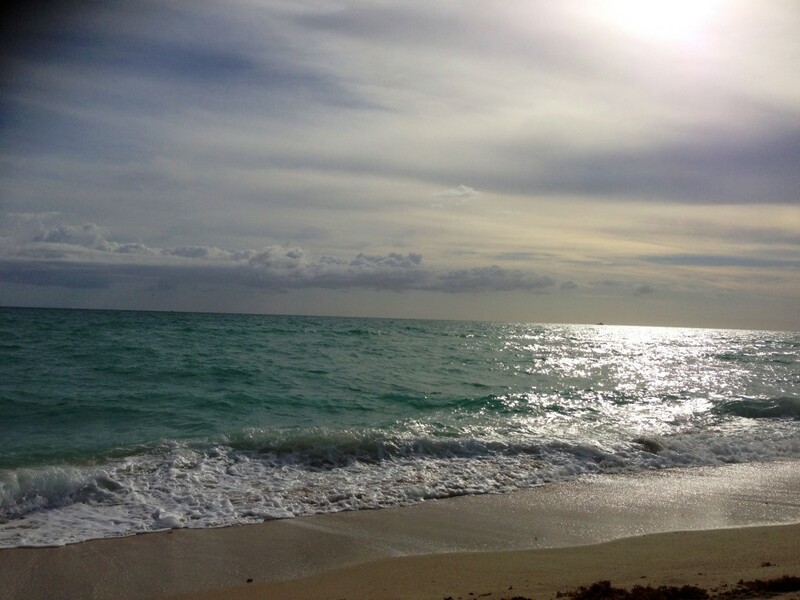 It was a few days into the New Year, and I had finally escaped the cold city for a few days and hopped on a flight to South Florida. I didn’t know exactly where I was going to go after my trip to the Keys for a few days, but I desperately wanted to relax and rejuvenate somewhere, and when a friend I met in the Keys invited me to come see the Carillon Hotel and Spa, where she lives on the property, I knew immediately I needed to spend a few days. 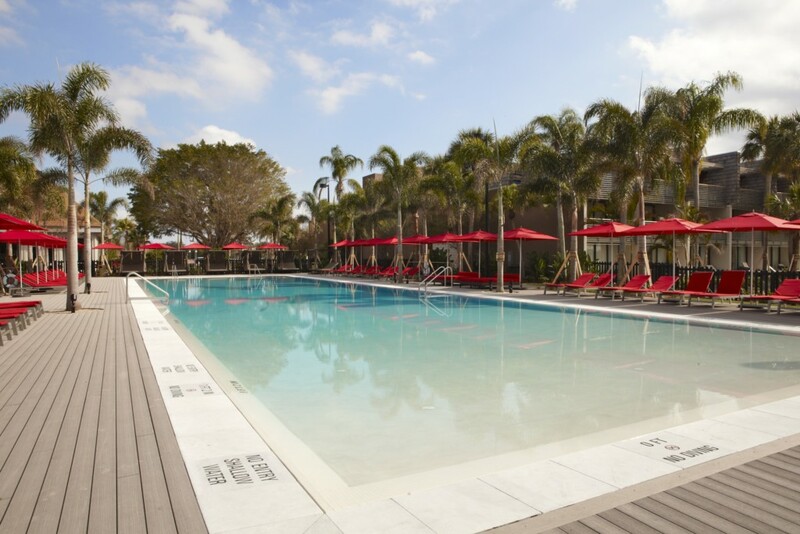 The Carillon Hotel and Spa, formerly the Canyon Ranch, is located on Collins Avenue and 69th Street, so close enough to the scene of South Beach if that’s of interest, but an oasis onto itself, and in my opinion, you never need to leave the property. Set on the ocean, there are three buildings, the north and south towers, which are residences with their own pools and Jacuzzis, a couple of workout rooms outside with views of the ocean, and the central tower, which houses the hotel, spa, fitness center, health and wellness area, lecture rooms, and an outdoor pool and Jacuzzi overlooking the vast ocean. I met one couple who goes once a year for their annual doctor’s visit with Dr. Koffler, the medical director at Carillon Hotel & Spa. They followed her from her practice in Chicago. An integrative medicine physician, she works with clients on a number of issues, ranging from weight loss and food allergies to getting to the bottom of whatever ails you. At Carillon Hotel & Spa, you can get advanced, on-site diagnostic testing, and the personalized care to figure out what may be the underlying causes of what is going on in your body, in a non-rushed environment, which we so often encounter at our own doctor’s office. With tons of options, you can make your visit work for you and your specific needs. 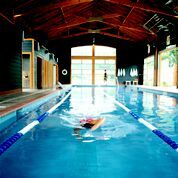 Many go with specific goals in mind, whether it be physical, mental or spiritual, and some just go to relax and enjoy the incredible spa facilities and participate in the wide variety of workout classes. Aside from setting up your own personal appointments with doctors, spiritual leaders, and therapists, there is a full daily schedule of fitness classes and free informational lectures covering a wide variety of physical and spiritual health and wellness topics. For the typical person from New York or New Jersey, it’s easy to get wrapped up in feeling as though you need to do everything. This time around, I did not schedule any one-on-ones, so I used my time to take full advantage of the classes, lectures, spa facilities and a deep tissue treatment, and left time to just lounge on a chair right on top of the ocean listening to the sounds of the waves crash against the shore as I closed my eyes and dozed off into a deep state of relaxation. 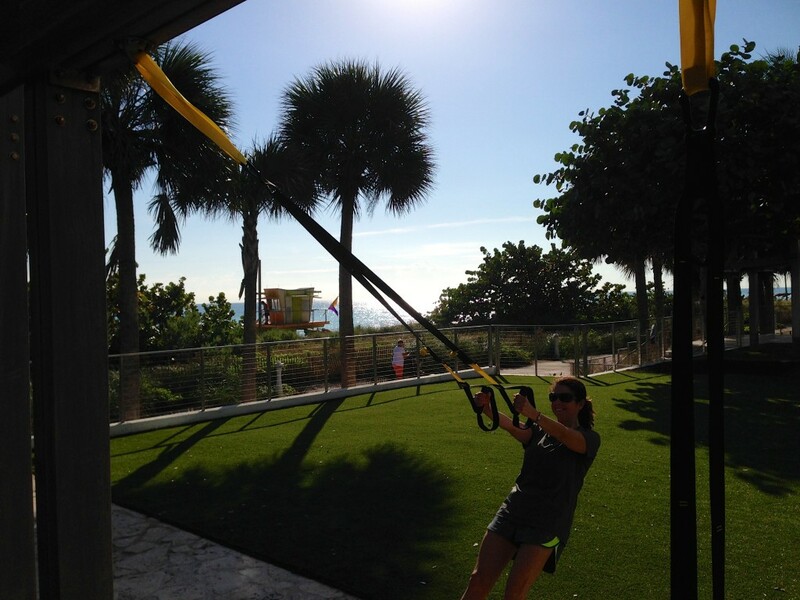 Since I wanted to make sure I got a taste of everything, I did the fitness classes I don’t usually do at home, like the TRX circuit class, which is held outside overlooking the ocean, and the gyrokinesis class that did a phenomenal job of releasing neck and back tension. The classes in the pool overlooking the ocean, such as tabata, were also quite invigorating and made for great workouts. I even got on the rock climbing wall as part of a rock climbing boot camp class. 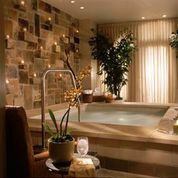 My muscles definitely got a workout, but when they were telling me how sore they were, I knew I could just hop in one of many hot Jacuzzis, or the Aquavana thermal suite, comprised of several hot and cold therapies to get your muscles to relax and detox. I have been in many steam rooms and saunas over time, but none have smelled as wonderful or relaxed me more than those at the ranch. Just one foot into the Aquavana area and I’m certain my blood pressure went down. I let myself enjoy an hour alternating between the Finnish sauna, the igloo, which sprays three different aromas into the air, the crystal steam room, the showers which have three different storm settings to ignite the senses, the hydrospa and footspa, and the herbal laconium, which provides gentle humidity infused with fresh herbs. The heated chairs cradle your back and neck perfectly for complete relaxation. Downstairs is the treatment area, where Richard Herrara worked his magic with my deep tissue massage and bath. The 80 or 110 minute treatment starts with a therapeutic bath infused with Dead Sea salts and mustard products that massages every part of your body, followed by a deep tissue massage. Richard is an incredible therapist who knew the perfect amount of pressure to yield results, while still ensuring a relaxing treatment. The food at Carillon Hotel & Spa is not only healthy, with all of the calories and fat, carb, protein, fiber and sodium content written on the menu, it is phenomenally delicious. For breakfast one day I ordered the tofu scramble, which was prepared with just the right flavor of spices, a side of delicious smoked salmon and fresh berries with a greens juice on the side. Second day was their Mediterranean breakfast, which was just as amazing. The warm artichoke salad with a side of wild salmon was the perfect lunch to enjoy on the beach. While relaxing by the ocean or pools, there is cabana service, serving food and drinks. We are very lucky in the northeast to have such an amazing facility so close to home. 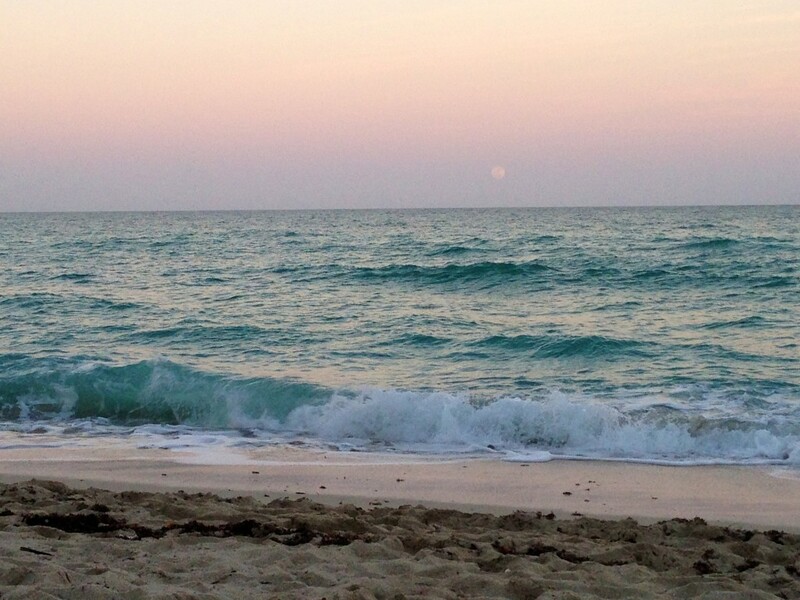 For the perfect combination of sun, ocean, fitness, wellness, healthy and delicious cuisine, insight and relaxation, look no further than Carillon Hotel & Spa in Miami Beach. It’s exactly what the doctor ordered to help with the winter or anytime blues. Previous Post: Does “Nice” Mean Boring?